It’s here! The time has come once again to mail off the Letters to the Future. To the Scullen graduates of 2012, which is this year’s high school graduating class of 2016, congratulations! In evolving with the times of teaching Health Education, naturally I need to incorporate social media in an extension of my classroom. Online interaction keeps me in touch with thousands of students, past and present. This portion of my website is dedicated to you, students of the past. I continue to incorporate Facebook, Twitter, Instagram and Snapchat into my Health class content. You can find me on all outlets under my pen name: @ScottAmpersand. In years past I wrote about the addition of this media, explaining how I’ve jumped right in to use all major platforms to spread both personal and public messages of physical, mental, and of course social health. In the meantime, the goal is that my profiles exist as a model for safe and appropriate use of social media. Why fight the trends when you can work right alongside them? “This is the future of America,” I write every year. And so, here we are. Living in the future of your 8th grade experience, the present constantly becoming our past. I still teach at Scullen Middle School in Naperville, Illinois, in the same classroom in which you sat back in 8th grade. Some assignments and activities stick around, others have run their course so that new ideas, articles, and video clips can suit the ever-changing teenage life. And so I urge you, young readers, to do the same. To write for yourself, and to share with others that which you feel necessary. 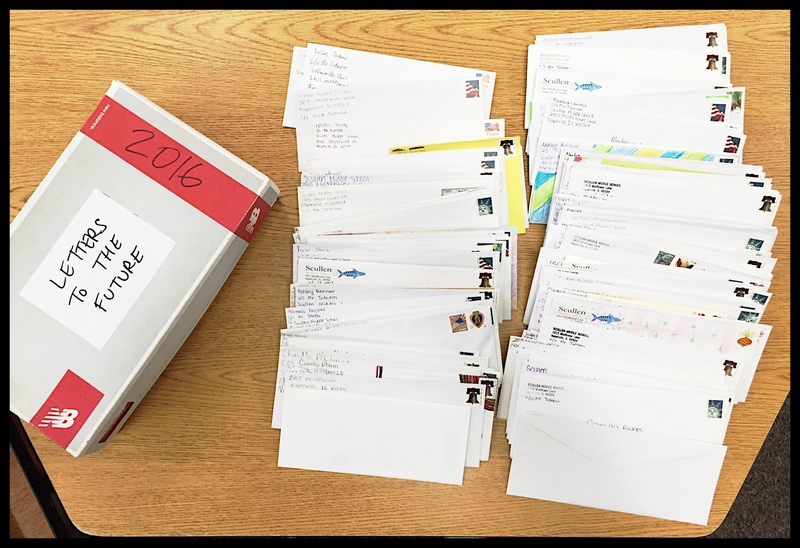 I did this for you in your 8th grade year; I offered a chance to write to your future self. Ultimately some decided against it, and have nothing to be delivered in the mail this month, unfortunately. But if you’re reading this, and you’re one of the graduating alumni from the 2011-2012 Scullen school year, then well done. You did it! You wrote a letter to yourself, from your past, to your future. Not only that, you survived four years of high school, and we all know how tough that can be. If you received your letter, you’ll see my personal note and links to social media, and you’ll also see I included a sticker to remind you of our Sticker Wall activity that we always did. Remember, you were motivated enough to put stickers on a wall… haha. That means, with the right motivation, you can do anything in life. After all, life isn’t about finding yourself, life is about creating yourself. I encourage and challenge you to use whatever media accounts you have to send me a note. I know time is precious, but today, see if you can take time to let me know you received your letter– send me a quick message, a picture, or anything you decide to let me know it has arrived. Use your favorite media outlet to connect on Twitter or Instagram or Snapchat if you are willing. Don’t worry, I don’t follow back. Your business is your business. Use the hashtag #LettersToTheFuture and let me see what everyone is up to. Want to write for me? Please consider writing for my Alumni Page to share stories and give back to this world that we share. Contact me if you’d be willing to contribute! Or come say hi for a quick visit… my door is always open. Congratulations once again, and I hope your letter finds you well. Stay healthy, and enjoy life in the future!